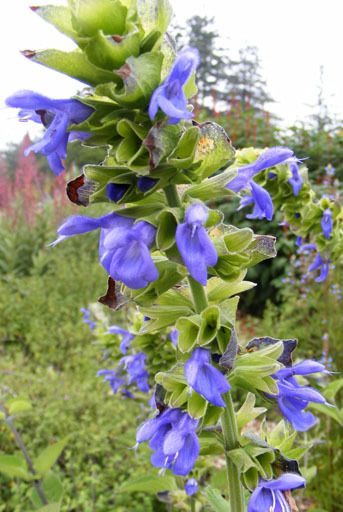 The trip to Cabrillo College and the Salvia Summit went well. All the talks were engrossing and everyone remained at a comfortable high degree of participation throughout the whole conference. I did not want it to end, but enjoyed the visits to Suncrest Nursery and Ginny Hunt's, Sandi Martin's, and Betsy Clebsch's gardens as well. I got to spend some time by myself at Cabrillo College photographing Salvias during the morning before the fog and cloud cover melted off usually by 9 to 11 AM. I even was able to take some flat bed scans of a few of the Salvia flower heads. Click on the links below to enjoy the images. Some of these sages are currently available from nurseries, and others may be soon. There is no back link to my home page. Use the Back button on your browser. 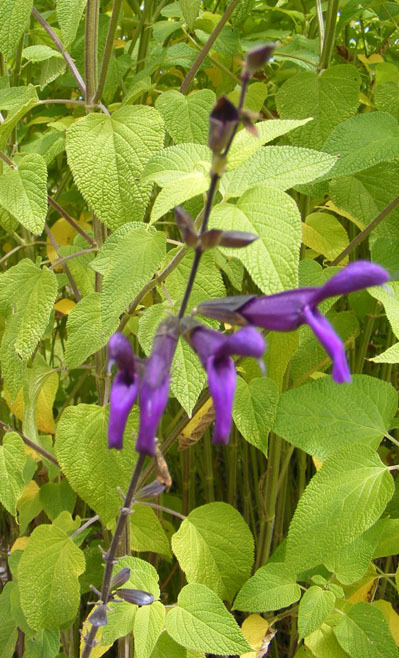 Salvia amarissima is a relative of S. urica and has a similar habit. It should be a good seed producer and bloom late summer through autumn. 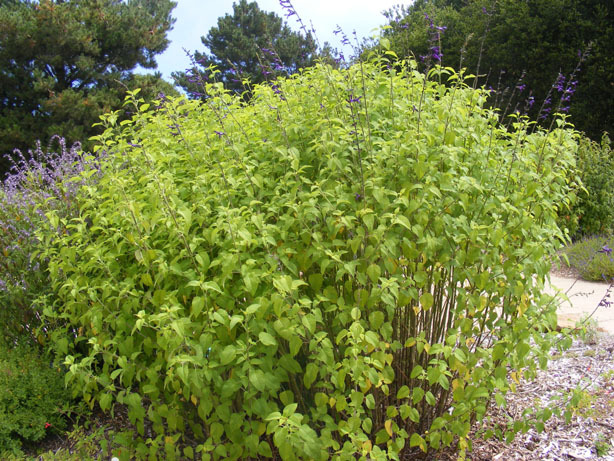 It is a medicinal plant known as Bitter Mexican Sage. It should be hardy in USDA zone 9 and do well in the southeastern US, and possibly in the rest of the country as a temperennial, depending on when it blooms. 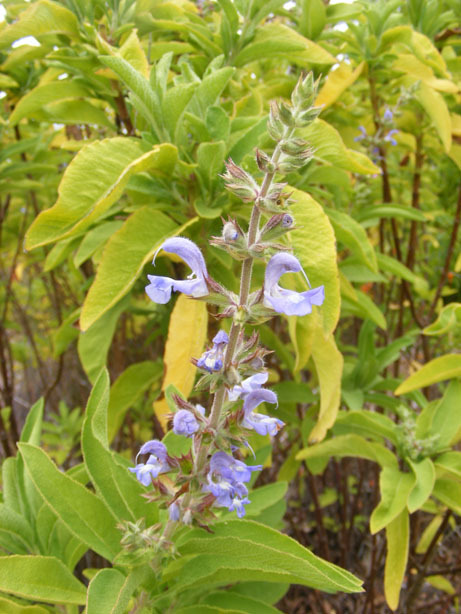 Salvia atrocyanea is a relative of S. guaranitica. It does much better at Cabrillo than it does for me and Tony Avent (Plant Delights). I need to see it tried in some other climatic zones before I give up on it. It seems to do well on the west coast. It definitely has possibilities, probably as a temperennial in much of the USA. 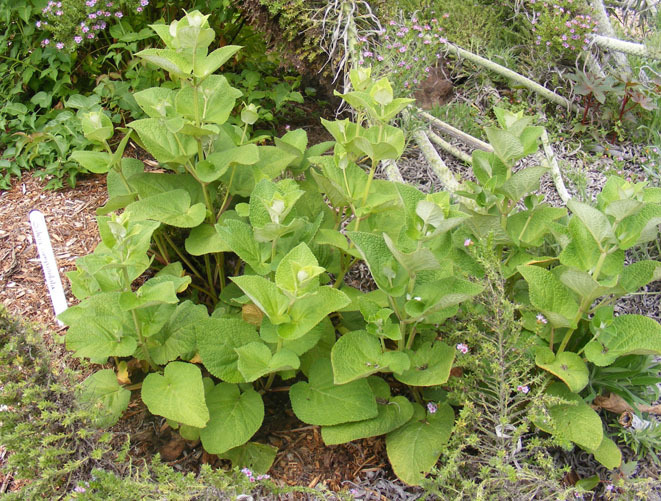 This sage is found on the Canary Islands and has a lot of similarities to S. aethiopis and S. sclarea. It appears to be a good candidate for Mediterranean and desert climates. 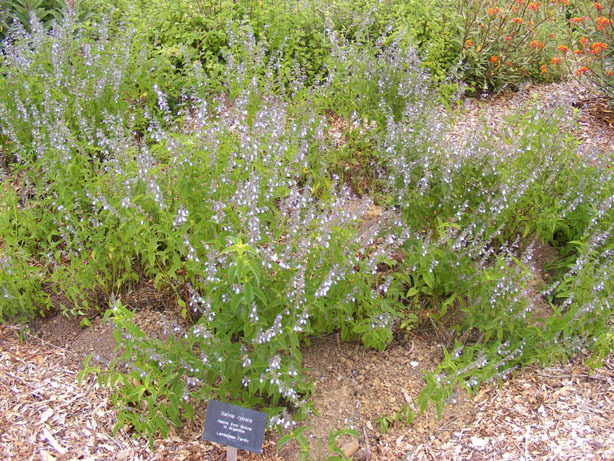 This sage is a relative of S. patens, but is reliably hardy in USDA zone 7, both in arid and humid conditions. 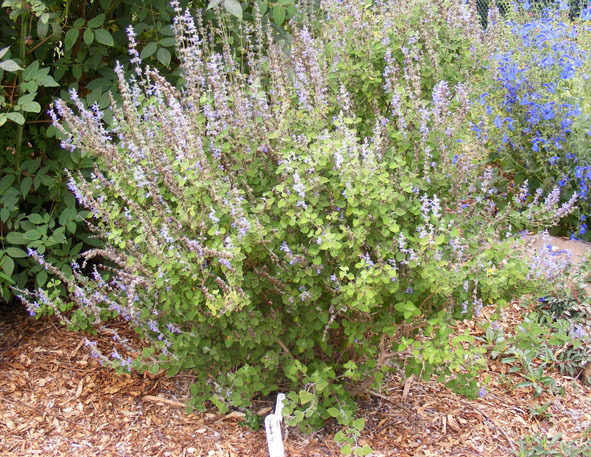 It can be used as a large ground cover or in a large container, and is good spilling over a bank or wall. The flower color is a fully saturated true blue. 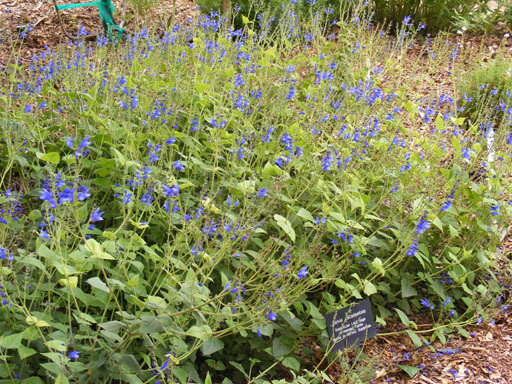 Salvia campanulata is a Chinese sage with large foliage and does not do well in the southeastern US, as far as I know. It may be hardy in the midwest and northeastern US, and will do well in the Rocky Mountains and west. S. cardinalis is now regarded as fulgens, but there are still a lot of herbarium specimens that have been labelled as such that may be S. gesneriflora. I am keeping cardinalis as my choice for the name for this plant until I have an answer to the puzzle. 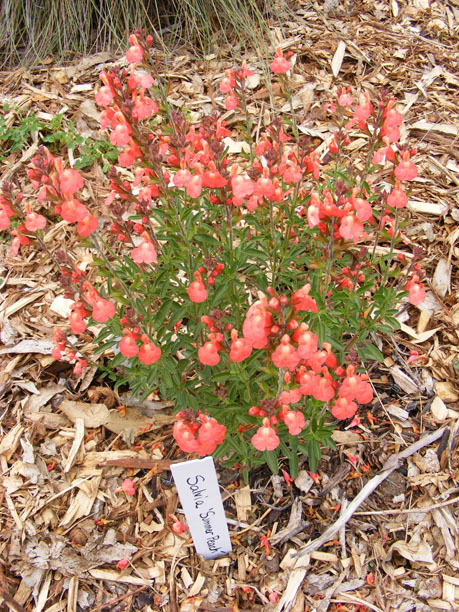 It can do well in the southeastern states as long as it is planted during the cool season and gets established. 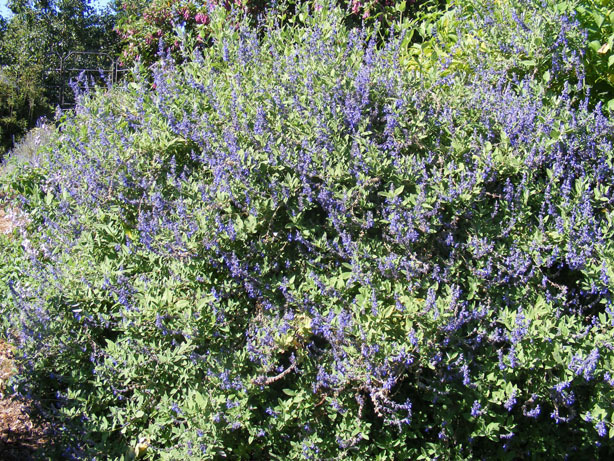 It can spread as a tall ground cover., but was more of an erect bush at Cabrillo. The aromatic bracts are very distinct and form a transitory involucre. I'd say it is hardy to USDA zone 8. 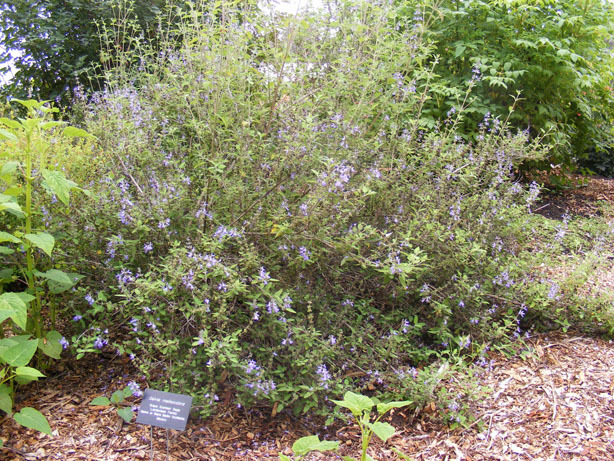 S. chamelaeagnea is a typical dense South African shrubby sage. It is more durable than others to humidity and light frosts, but can rot out at the base if the weather is too wet. Thinning out the stems at the base and removing the congestion of dead leaves at the base helps get air into the base and keeps it dry. S. coahuilensis is related to S. greggii, S. chamaedryoides, and S. lycioides, and may be derived from them. The flower color is a good hint. The less red in the color, the more likely it is to be the species. This is also true for S. muelleri, which is royal purple in the plant now going around. There are populations of these species in the wild that meet the blue criterion. This accession of S. coahuilensis is more likely to be accurately identified. Like the so-called S. lycioides x greggii forms, S. coahuilensis and S. muelleri in cultivation make good ground covers in arid areas. S. coahuilensis is USDA hardy in zone 8, S. muelleri in zone 7, at least in the humid southeastern USA. 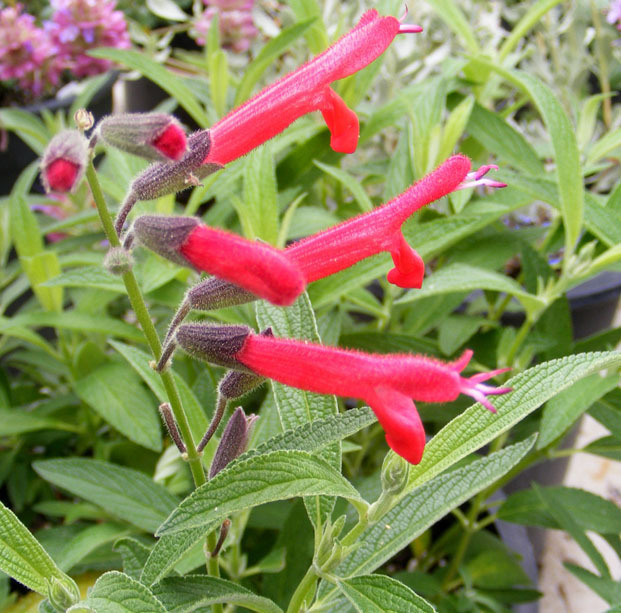 This sage is from South America and is supposed to be related to S. splendens. The latter is radically different from all of the other members of its section, which look like S. confertiflora. 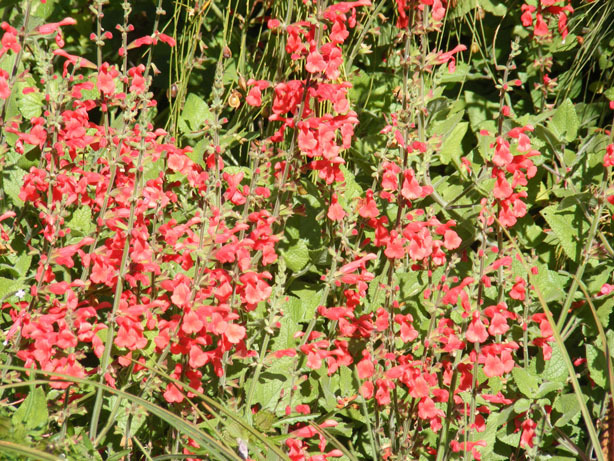 The long, thin spikes with coral button flowers and brown floral stems and calyxes make this plant a possible cut flower, useful for Thanksgiving displays, since that is when it blooms. It has to be grown as an annual through most of the United States. It has a habit similar to S. leucantha. Try it as hardy perennial in zone 9. S. corrugata is from the central Andes in Ecuador and is unusual because the flowers are both blue and tubular. They are found in dense, lax spikes. I'd grow it for its foliage, which is nicely textured. The leaf veins on the underside and petioles are covered with short red hairs. It has possibilities in the southeastern US, especially in the mountains, where it will be a temperennial. 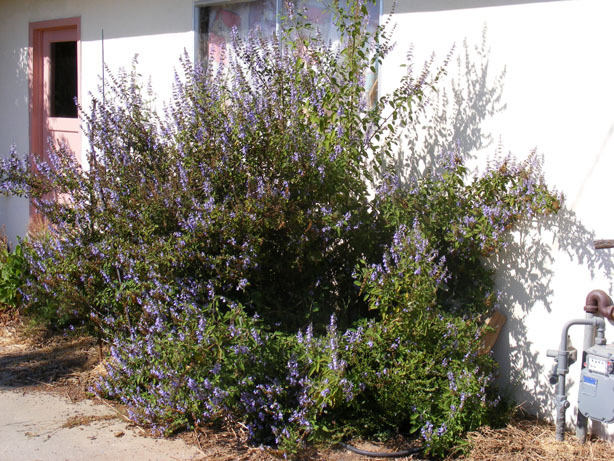 It can be used as a large container plant, forming a large, lax bush. 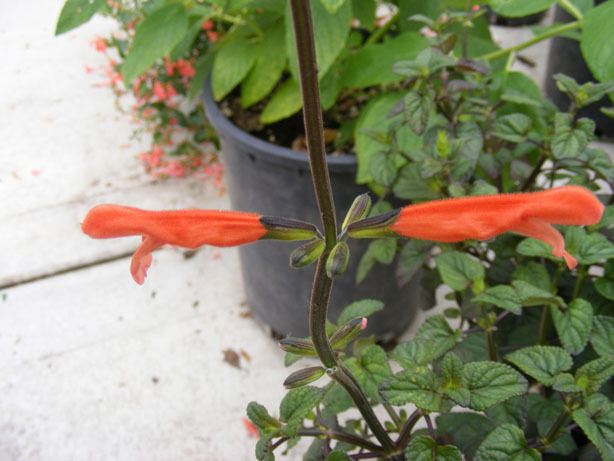 Next is a closeup of Salvia curviflora, as a 5 gallon pot in the Cabrillo Bot Garden nursery. I expect it to be a good hummer plant along the Gulf Coast as well as the Pacific. I estimate its hardiness at USDA zone 8. It is closely related to S. purpurea and S. littae., and perhaps to S. iodantha. My plant started to bloom during the summer, but aborted in the heat in favor of more growth. I am anxiously awaiting autumn bloom. I am still not satisfied with the placement of this species amongst its other cousins, but that does not keep it from being a really nice ornamental. It grows well in the southeastern USA, especially if it has good drainage. It is hardy to USDA Zone 7. It has a tendency to form stems that lie flat on the ground and root like stolons. As a result, it forms a dense bush after a few years. It does bloom well during the summer and has the largest red flower of any species at that time of year. 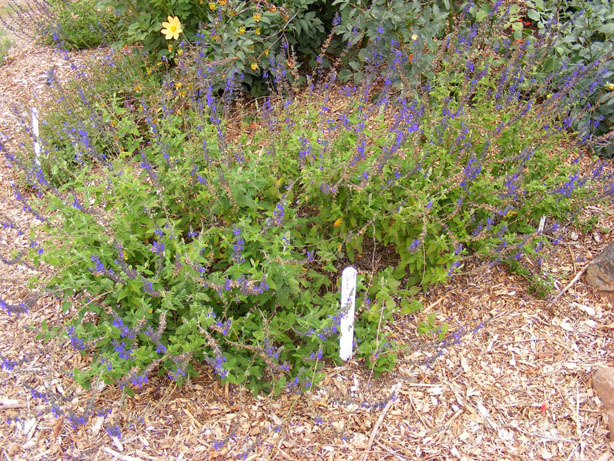 Salvia dolomitica is another South African shrubby sage, more durable to humidity than other related species. 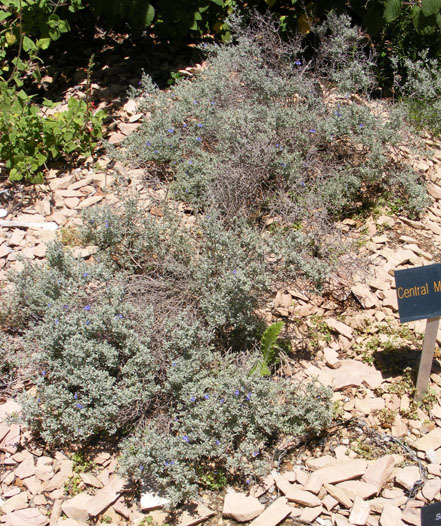 It is found on dolomitic soils, hence the name. I think it is hardy to zone 9, possibly 8 with good air and water drainage. It will tend to bloom late in the year. 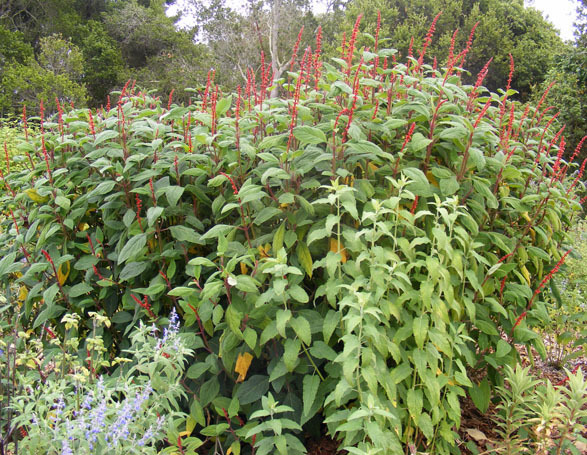 This sage is a sacred plant of the Incas, along with both S. tubiflora and S. oppositiflora,. The flowers are collected to cover a player in a pageant playing the sacrificial victim to apease the volcano god. The flowers symbolize his blood. The three sages are called locally ñucchu. The growth habit on this sage requires special attention. It grows just behind the edge shrubs at a clearing or tree line. For most of the season, it matches the shrubs behind it, and after these have stopped growing and while there is still some good growing days, it pokes forward through the shrubbery and forms lax stems that hang down. 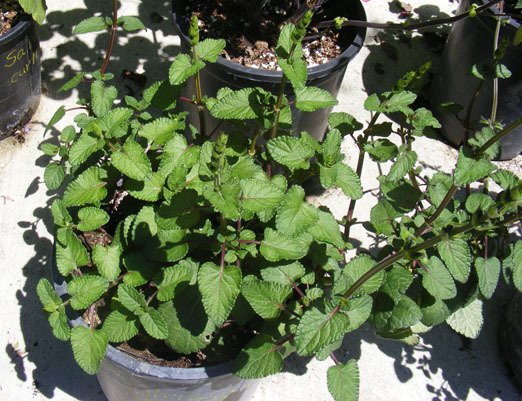 It likes shady areas near but not in sun and a cool area in the southeastern USA during the summer and bright cool sun in the greenhouse during the winter. Humusy soil helps a lot. 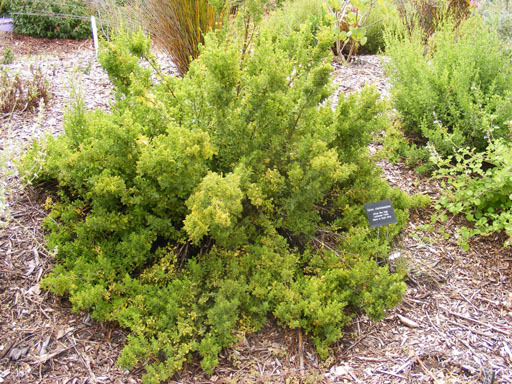 S. flocculosa at Cabrillo is a smaller bush then the one growing a few hundred feet higher in the hills at Sandi Martin's garden, but that may be an effect of the time of planting and soil and watering. It definitely looks like a xeric plant. 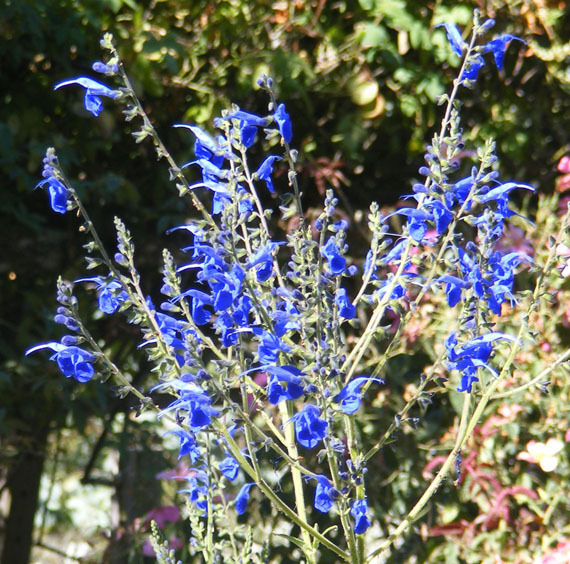 Here is Salvia flocculosa (this may have been first called S. cruickshankii, with a revision by Christian Froissart) at Sandi Martin's garden. It strikes me as being a S. chamaedryoides on steroids. It has smaller flowers, but lots of them, and can get 10 feet. I am guessing it is hardy to USDA zone 8. 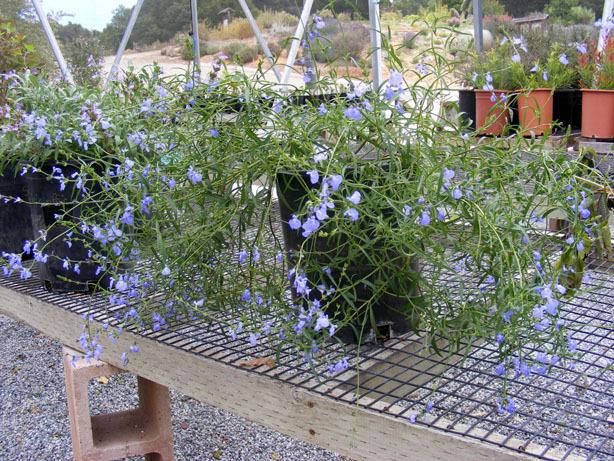 It looks like it might make a good screening plant for lot boundaries in arid areas. 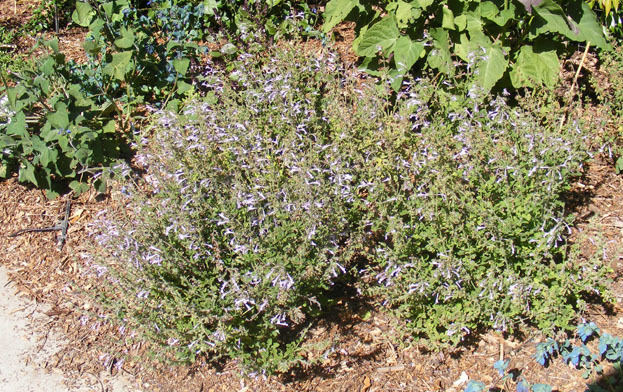 This relatively common sage can naturalize in California, but not uncontrollably. It is marginally hardy in USDA zone 7 in the southeastern USA, and needs good drainage. It is a good summer bloomer. It is native to the coastal plian around the Black Sea. Seeds of this species are often found in packets labelled as various Chinese species, especially hians. 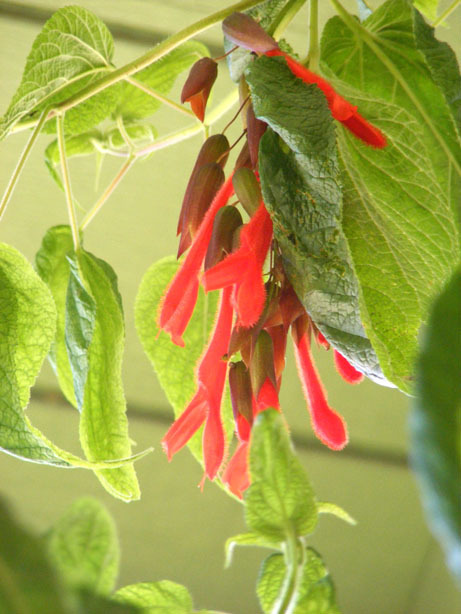 S. gesneriflora is a very fast growing sage, getting up to 15 feet in one year. It is too late a bloomer to be useful as a garden subject in USDA zones 7 or cooler. It makes a good greenhouse sublect, and can be kept in large pots for occasional surprise blooms in late autumn, sometimes earlier, and in the spring. It usually gets only 6 to 8 feet tall in the southeastern USA. 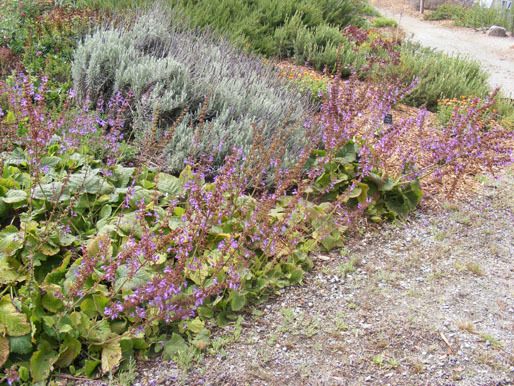 This is Salvia greggii Summer Peach at Cabrillo. I don't know if this one is in production at Suncrest or other growers, but it should be. The density of blooms is striking. This species and its forms do well as temperennials in cooler parts of the USA. In the southeastern USA, some shade is useful, and good drainage mandatory. It does better in the piedmont and mountains than at the seacoast of the southeastern USA, although some growers from these areas report success. The flowers of 1Jean's Purple Passion' are similar to those of `Purple Majesty'. Trialling of all three hybrids side-by-side will be needed to tease out the differences amongst them. This sage was collected by Yucca-Do some time ago and identified initially as S. melissodora. This may change again, since the whole section is troublesome taxonomically. Its hardiness and use horticulturally is similar to that of S. melissodora. This was close to the top of my list of eureka plants on the trip. It is the only other sage that has calyxes and petioles densly covered with medium hairs. Many others have much finer and shorter hairs, but only in S. lasiantha and S. leucantha are they that wooly and brightly colored and the spikes that tightly packed. It looks like it will be a good summer grower, even in the southeastern USA. 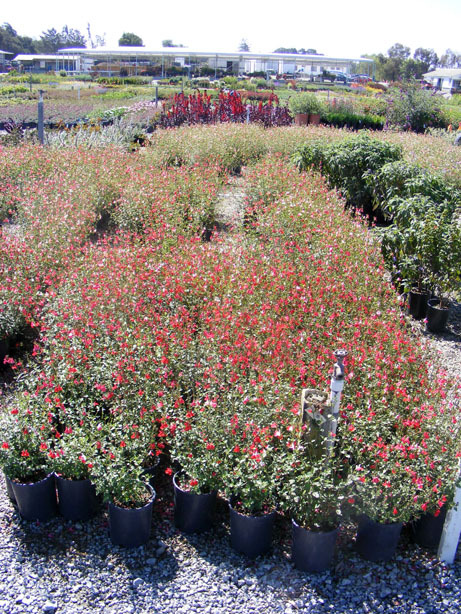 Its bloom period needs to be determined, and it is probably hardy to USDA zone 8. 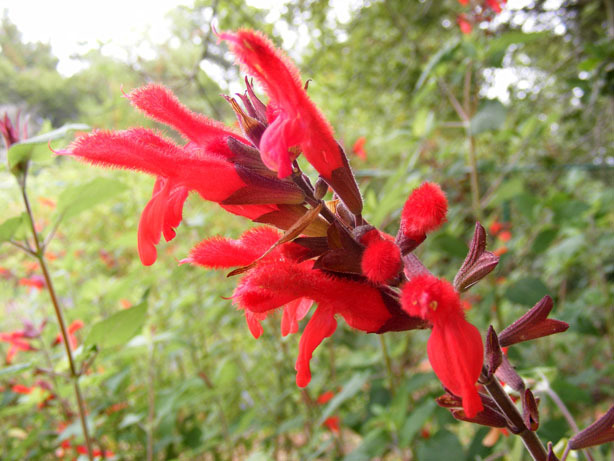 Salvia lycioides, especially the forms from the Guadeloupe Mountains on the Texas-New Mexico border north of Big Bend, are pretty durable in USDA zone 6. It needs drainage and heavy rains will mess it up unless it has good drainage. It is also found at the higher elevations of the mountains around Saltillo and Monterrey, and may be a parent of other blue sages it is related to, such as S. coahuilensis and S. muelleri, found at lower elevations, often in swarms with S. greggii and S. microphylla forms. 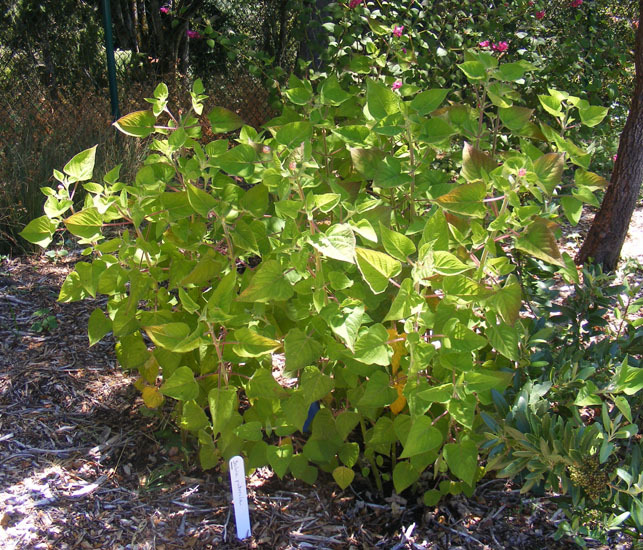 An erect form of S. macrophylla, with large leaves which have burgundy colored undersides. This appears to be more humidity tolerant as well. It looks like it could give Canna lilies a good run for their money. I hope that Ginny Hunt still has seed of this one available. This is the more commonly distributed form of S. macrophylla, and it is more durable than its close relatives, S. sagittata and S. scutellarioides. It will bloom freely in cool weather. 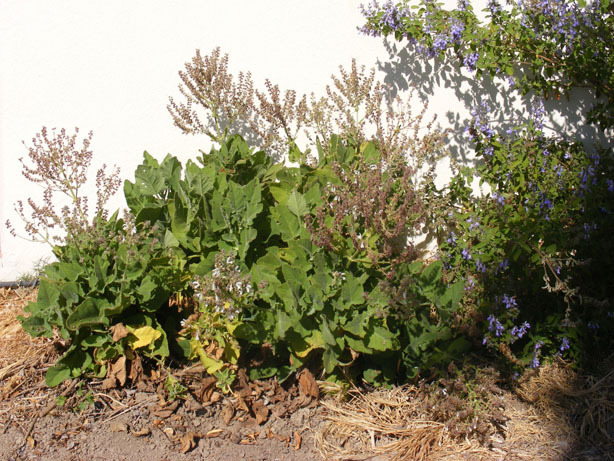 It has a growth habit like a squash, spreading rapidly along the ground and rooting as it goes. It sets seed well. 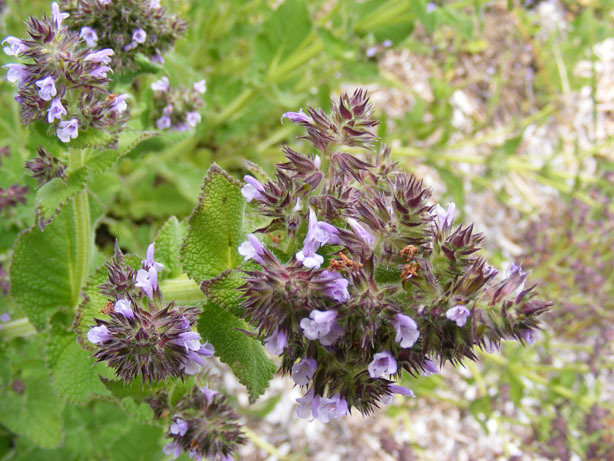 Grape scented or Tarahumara Indian Sage was found by Diana Arias near the western edge of Copper Canyon in southern Durango. 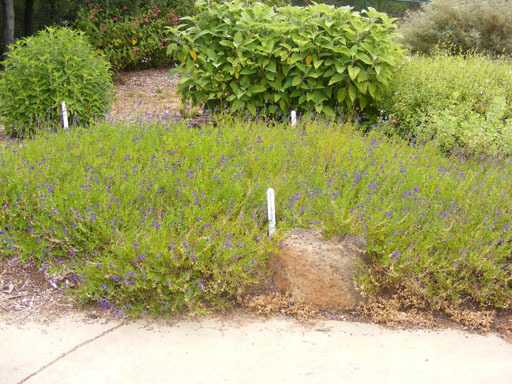 It makes a very nice temperennial east of the Mississippi, and should do well in USDA zone 9. Unusual for sages, the flowers emit a grape scent on their second day of full bloom. The foliage has a woody, resinous scent. Here is the Tarahumara Grape-scented sage (S. melissodora) at Ginny Hunt's home. At her higher elevation from Cabrillo, it is more robust. It is hardy in USDA zone 9, possibly 8. It does very well as a temperennial in cooler parts of the USA and starts to bloom by mid summer, providing nectar for many bees, butterfies, and moths. It also makes a good container plant. 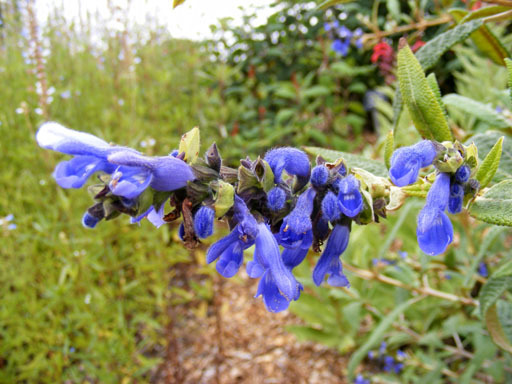 A closeup of Salvia melissodora, Grape-scented at Ginny Hunt's home. You can really smell the grape scent, and the moths, butterflies, and bumble bees were busy. Hot Lips rocks. It is not only unique as a plant with variously colored zones in the flowers, but is a very tidy and durable plant in North Carolina. The color of the flower varies from solid red in cool weather and when fed with all the moisture and ferilizer it wants. The flowers develop a progressively larger white zone in the middle of the flower spreading outward. This effect is maximum in hot summer weather under nutrient and drought stress. It is from the mountains of Oaxaca, which is surprising, since the more fleshy form found at lower elevations found in neighboring Chiapas and Belize is the tenderest form (Huntington form). The latter is also aromatic and late blooming, while Hot Lips is weakly scented and blooms well during cool summers. 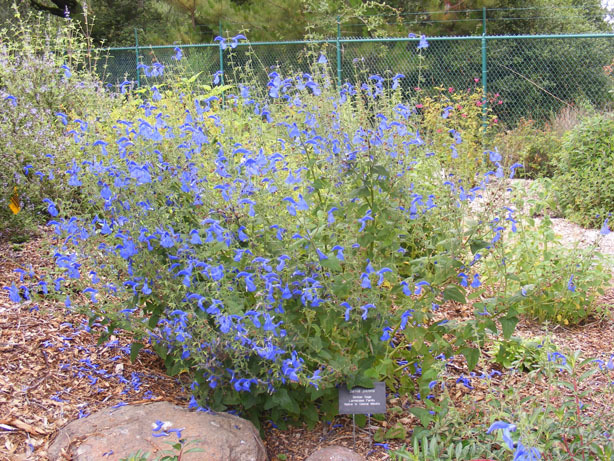 This one is a Cabrillo nursery plant of Salvia nana. It makes me think of a larger S. glechomifolia, with lots of blue flowers. This is not surprising because they are in the same section, along with S. sinaloensis, S. uliginosa, S. forreri, S. villosa, and S. prunelloides. The last could be confused with glechomifolia. I assume it will be a good summer bloomer like its cousins, and produce seed as well. I suspect it will be hardy in USDA zone 8. Found over a wide range of the eastern Mediterranean into Palestine, this plant is invasive and generally not useful or durable in the southeastern USA. At Cabrillo, it develops some rather nice flower spikes. Deadhead to keep its seeds from spreading. It is probably hardy to USDA zone 8. 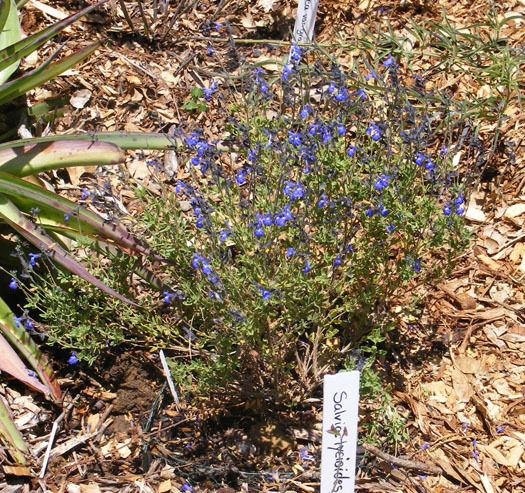 S. pachyphilla is a high mountain meadow sage of arid interior southern California and suitable as a durable plant in the southwestern USA. It is quite hard to keep in the southeastern USA. It looks like it would be useful in the mid Atlantic coast and interior mountains of the US, although it may need to be brought inside for the winter. 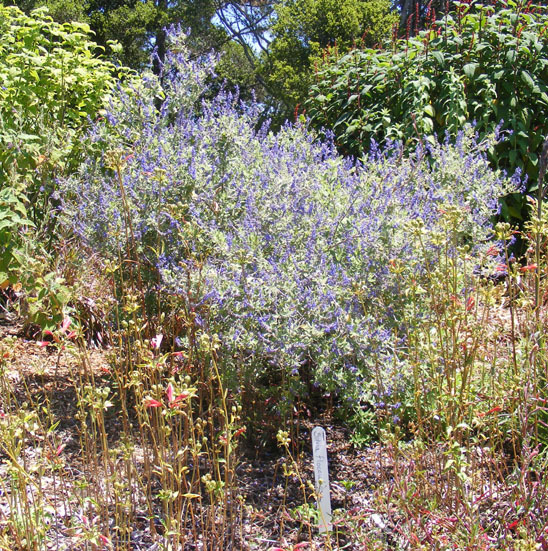 This was the most stunning sage in the Cabrillo garden. I have never seen so robust a form of S. patens. I hope this vigor will translate well in North Carolina. This might be the robust form that Robin Middleton sent to Cabrillo. The area under the gentian sage was nearly a solid carpet in spots of spent blue flowers. I wonder what the seed set was like. Whatever its origin, I hope that the folks at Cabrillo are collecting it. This sage was collected by the folks from Yucca-Do, far north of the known collection areas. It differs from the following form in having much broader, light green, persistently hairy leaves. It is a robust bloomer, though later than the others. It is hardy and reatively durable in North Carolina. 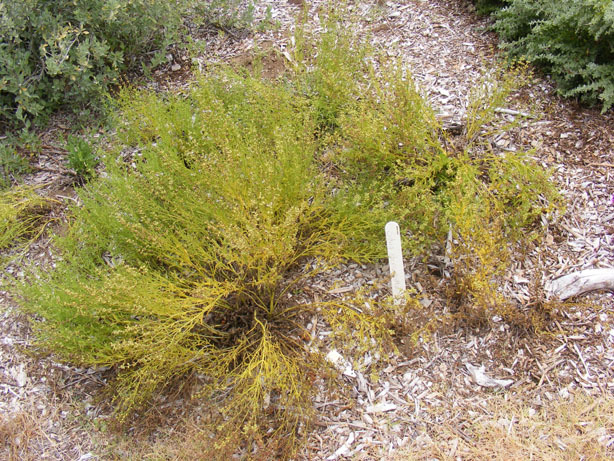 S. puberula usually differs from S. involucrata in the spring, when it breaks dormancy. The first leaves of S. puberula are quite hairy, while those of S. involucrata show few hairs. El Butano retains them throughout the year. This area has other disjunctive sages. S. jorgehintoniana is a disjunct of S. longistylis perhaps not deserving separate status. 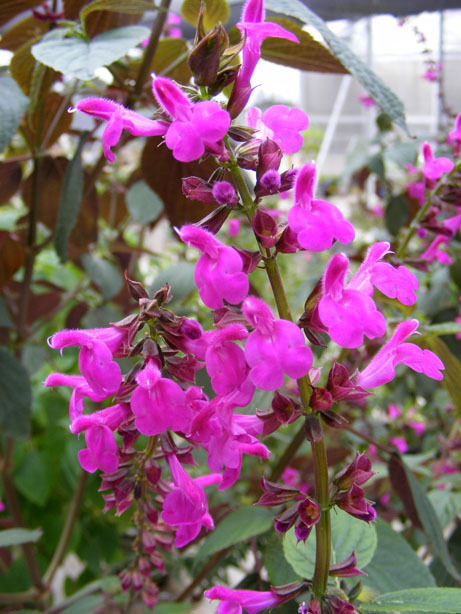 It is named after the famous American botanist, George B. Hinton, who collected many Salvias in Mexico eary in the 20th century. THe collection area around the Eleven Sisters ranges in Nuevo Leon and Coahuila south to Tamaulipas and eastern San Luis Potosi may hold a lot more surprises for disjunctive populations of known sages. There has been some confusion about this plant, caused by the fact that Epling and Mathias redefined it as a variety of S. involucrata. There may be further evaluations that I do not know about. Because of the tendency to be brief, I retain the use of S. puberula. 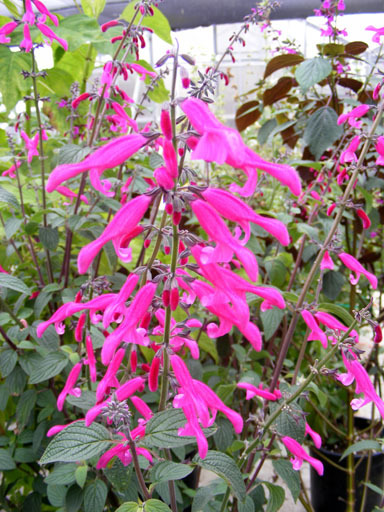 I would prefer that everyone use the name Salvia involucrata v. puberula Hidalgo. I collected this plant near the type location along the old PanAm highway in Hidalgo, and am afraid that it will be lost to cultivation, even though it is the toughest of all the S. puberula and S. involucrata forms. It is not quite as erect as the oldest form, S. involucrata bethelii, but blooms earlier. Both kept growing through the bindweed and Johnson grass of an abandoned garden for at least three years. It is scarcely differentiated from S. involucrata El Cielo, a Yucca-Do collection from the El Cielo Biosphere in southern Tamaulipas. This Bolivian beauty surprised me, as I had gotten the impression it was not showy. 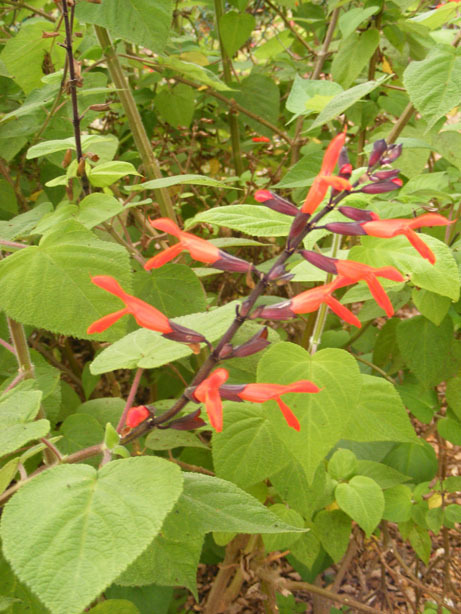 It matched S. curviflora in display, and had burgundy colored leaf undersides, blending well with the fuchsia flowers. It might do well along the Gulf coast of the USA. Bloom period unknown, probably late summer or autumn. It is related to S. caudata, S. roscida (S. fallax), and S. myrianthus. I don't know if this is the tall west Texas form, the old east Texas form, or a different collection altogether. It does not look like the first, which is erect and has deep true blue flowers. Hardiness is to USDA zone 8. The tall one from the Guadeloupe Mountains is more durable and hardy to zone 6. 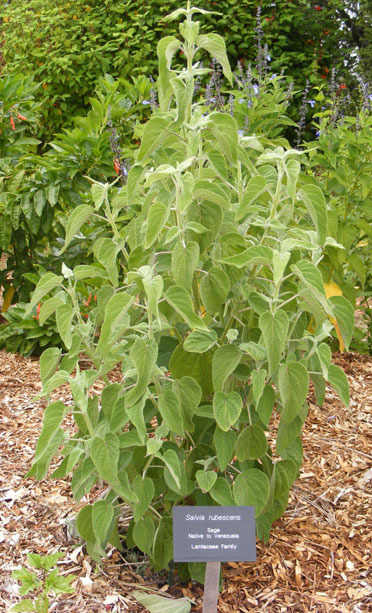 This sage is found in Venezuela, and the rest of the forms further west and south in Columbia to Bolivia. It has proved to be difficult in the southeastern USA, but will put on a nice show of 1.5 inch scarlet flowers up in the mountains, although it is not hardy there. 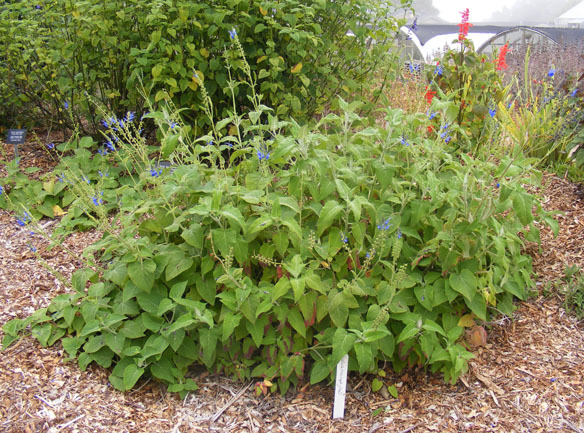 Salvia rypara is found in Argentina and Bolivia along watercourse meadows and spreads via short stolons to form dense clumps. I think it might be hardy in USDA zone 8 and be moderately tolerant of humidity. It is not the same as S. riparia (now considered identical to S. misella). 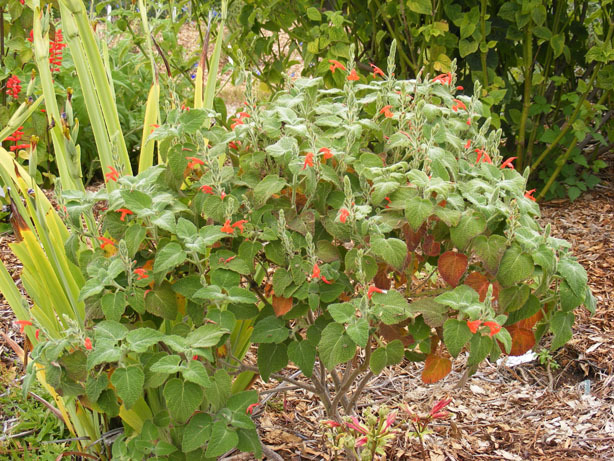 Both forms of S. misella are American tropical plants, mostly of Carribean lowlands. Finally. 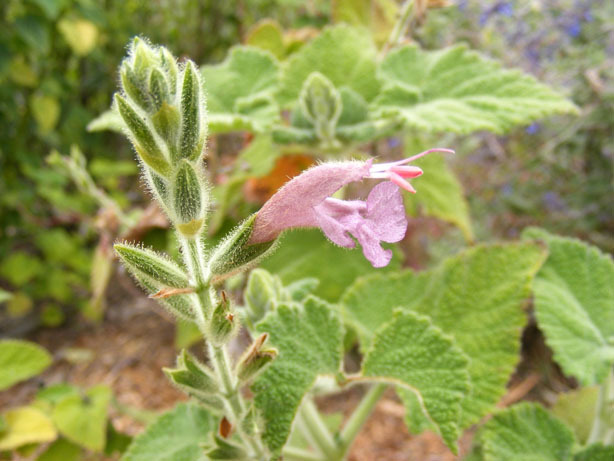 a Salvia sagittata x macrophylla hybrid from Betsy Clebsch's garden that Christian Froissart identified as S. macrophylla x sagittata. 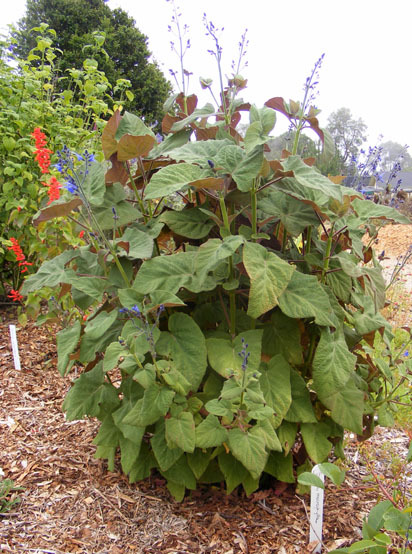 The macrophylla was probably the large upright form, based on the leaf size and the upright habit of the plant. It has the vigor and durability of S. macrophylla and much of the form of S. sagittata. I think it will do well as a temperennial and also in the southeastern USA. You will need a lot of room for this one. 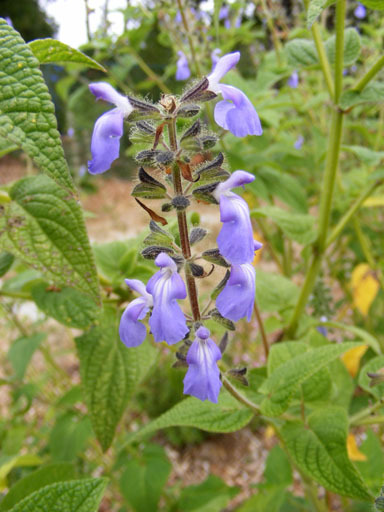 This is a closeup of the Salvia sagittata x macrophylla hybrid from Betsy Clebsch's garden. This density of bloom is unmached by either straight species, and the flowers seem to be more prominent, with the lower lobes less deflexed backwards. In S. sagittata, the flower spikes are just as branched, but with long internodes. S. macrophylla spikes are simply or lightly branched, but are denser. 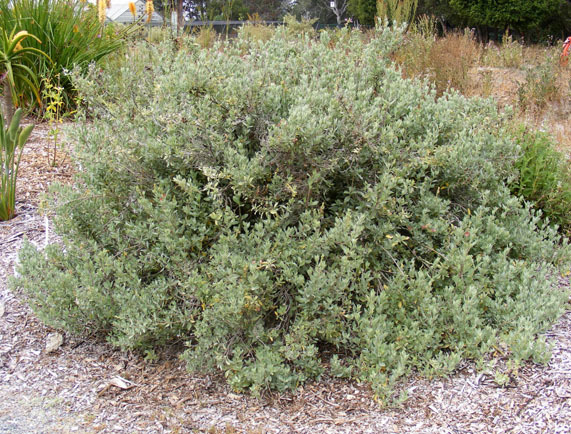 This South African coastal sage produces ample seed and comes from the coastal areas of South Africa, which is relatively humid. As a result, it appears to be a really good candidate for the southeastern USA. It has already demonstrated good tolerances to frost. Other South African sages that show this tendency are S. namaensis and S. chamaedryoides. S. repans white form is hardy in Raleigh, NC (USDA zone 7). This sage is new to me. 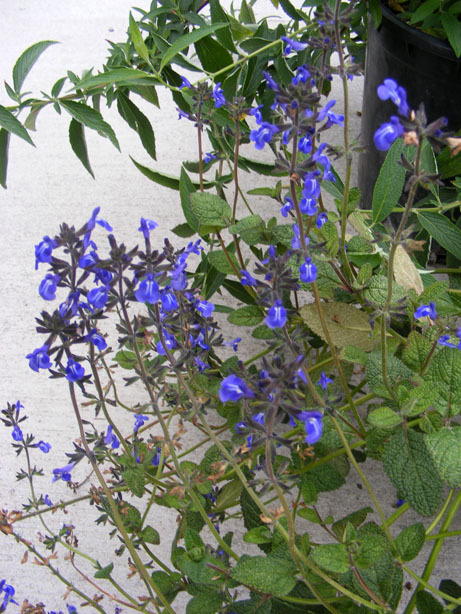 It has really nice deep blue flowers on long, thin spikes and should have the same horticultural needs and uses as S. keerli and S. melissodora. 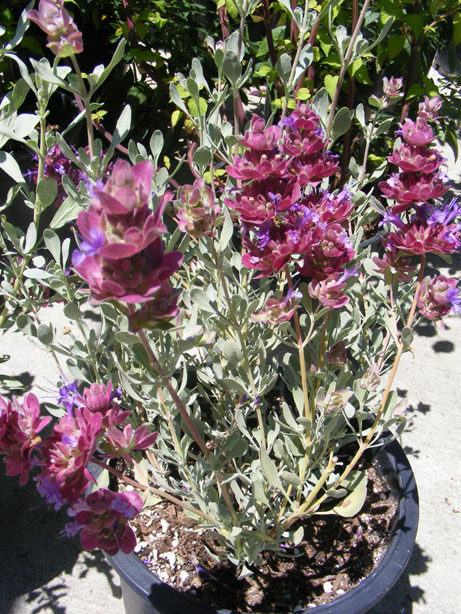 This sage is from the Horn of Africa and one of only a few from that part of the world. It is a good subject for desert and Mediterranean gardens, getting 4 to 6 feet tall. It has been in cultivation, but is hard to find currently. 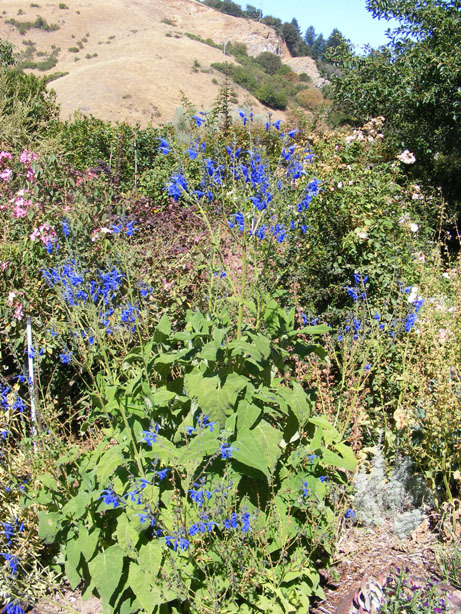 Here is Salvia squalens, growing in full sun in the Cabrillo garden. It looks as tough as its cousin, S. tubiflora, and this is a good reason to get me excited about trying it in North Carolina. Both tubiflora and its new cousin, species 411 from Peru, do well in the southeastern USA. 411 is awaiting taxonomic description as a new species. 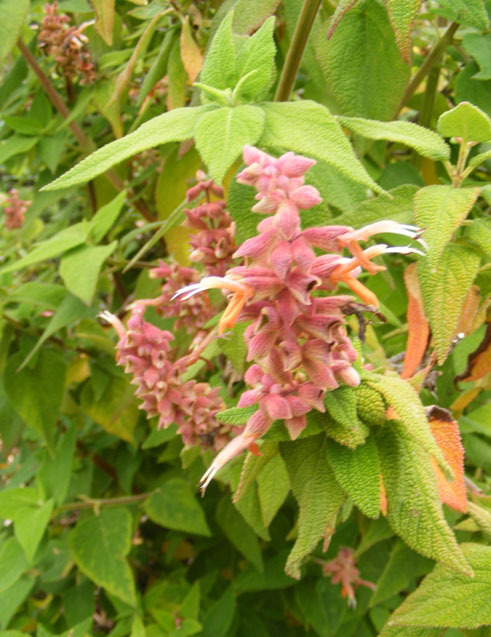 This is the pink flowered Salvia squalens, on a younger bush. I hope it is at least as robust and durable as the more common form. Evidently, it can come true from seed. I believe Cabrillo got theirs from Robin Middleton, who probably hand-pollinated his plants. The lacy stems and thin, dissected foliage makes S. stenophylla really different. The tiny lavender-blue flowers are numerous and much seed can be produced. I estimate that hardiness is to USDA zone 8. The flowers of this selection of S. stolonifera have a striking brick orange color and are fairly large. The main drawback of this plant is the long internode distance between the flower whorls. This is compensated by the numerous flower stems on a large plant. 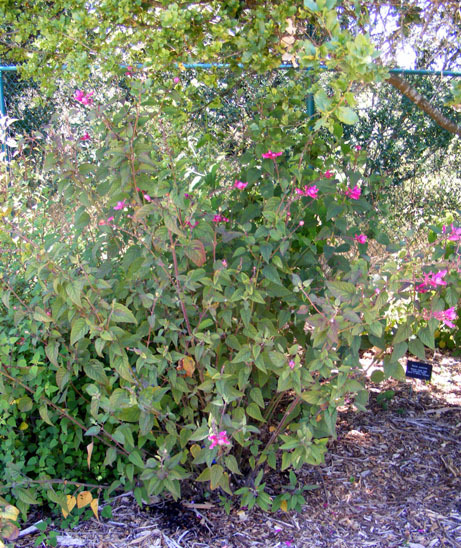 This compact shrub is a close relative of S. chamaedryoides and is acclimated to USDA zone 8 desert conditions. It needs great drainage and some lime. Originally collected by Dr. Jim Bauml from a crack between limestone boulders in Hidalgo, Mexico. 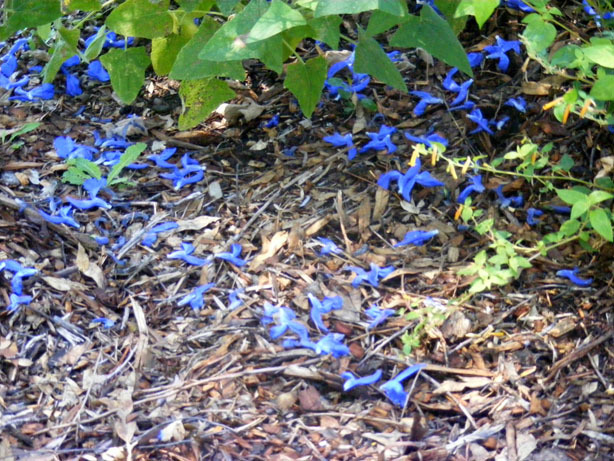 The deep blue flowers are small, but fairly numerous. Hardy to only USDA zone 9. 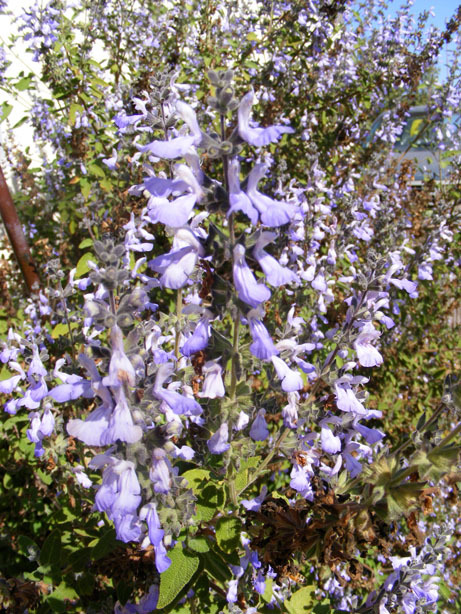 The last sage shown is Salvia x westerae, a hybrid of S. orbignaei x S. haenkei, and has rather large flowers. I expect it to develop into a lax, medium-sized bush that dies back in cold weather. It looks like it has promise along the Gulf and lower Atlantic coasts of the USA. Bloom period and hardiness unknown, but likely to bloom from late summer through autumn, requiring a good season of moderate temperatures. It is likely to be hardy in zone 8.